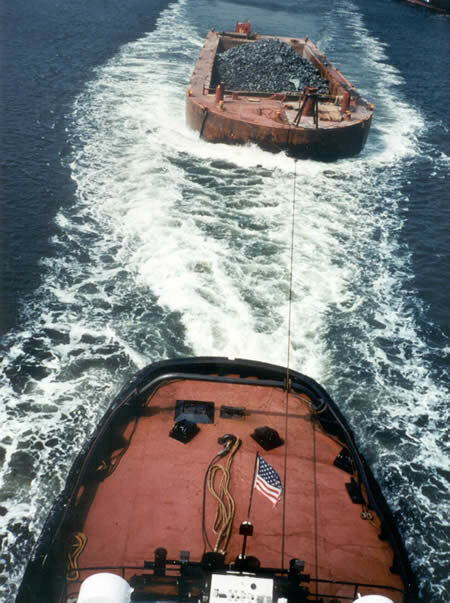 Thirty-four thousand cubic yards of dredge rock obtained from the NY & NJ Port Authority, Howland Hook Marine Terminal Berth Deepening Project will be deployed on the Shark River Reef Site September 16 through October 15, 2006. The shale rock will be transported to the site and deployed by hopper scow at a predetermined location. In total, 10 hopper scow loads of rock will be deployed on the reef site as part of the division's Artificial Reef Program. During construction, tugs will be pulling large barges of shale bedrock. Work on the site will be continuous so boaters must constantly be aware of the reduced maneuverability of these tugs and allow them the right-of-way. Adding rock to the ocean floor provides much needed hard-structure habitat for fish, lobster and other marine life. The rocky ridges will become attachment surfaces for invertebrate marine life, such as mussels, barnacles, sponges and anemones, and will provide hiding places for bottom-dwelling species like sea bass, blackfish, crab and lobster. The shale rock ridges will create productive fishing grounds for centuries to come. The deployment schedule is subject to weather and sea conditions. For further contact Hugh Carberry at 609-748-2022. 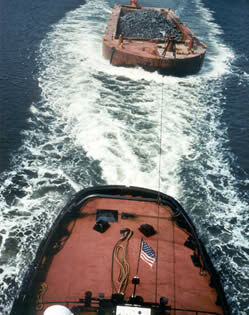 A hopper scow of rock being towed to reef site. Click to enlarge.